An artist's impression of the merger of two neutron stars. Short duration gamma-ray bursts are thought to be caused by the merger of some combination of white dwarfs, neutron stars or black holes. Theory suggests that they are short lived as there is little dust and gas to fuel an 'afterglow'. Credit: Part of an image from NASA / Dana Berry. (Phys.org)—A nearby short duration gamma-ray burst may be the cause of an intense blast of high-energy radiation that hit the Earth in the 8th century, according to new research led by astronomers Valeri Hambaryan and Ralph Neuhӓuser. The two scientists, based at the Astrophysics Institute of the University of Jena in Germany, publish their results in the journal Monthly Notices of the Royal Astronomical Society. Prof. Miyake also considered whether a solar flare could have been responsible, but these are not powerful enough to cause the observed excess of carbon-14. Large flares are likely to be accompanied by ejections of material from the Sun's corona, leading to vivid displays of the northern and southern lights (aurorae), but again no historical records suggest these took place. Following this announcement, researchers pointed to an entry in the Anglo-Saxon Chronicle that describes a 'red crucifix' seen after sunset and suggested this might be a supernova. But this dates from 776, too late to account for the carbon-14 data and still does not explain why no remnant has been detected. Drs. Hambaryan and Neuhӓuser have another explanation, consistent with both the carbon-14 measurements and the absence of any recorded events in the sky. They suggest that two compact stellar remnants, i.e. black holes, neutron stars or white dwarfs, collided and merged together. When this happens, some energy is released in the form of gamma rays, the most energetic part of the electromagnetic spectrum that includes visible light. In these mergers, the burst of gamma rays is intense but short, typically lasting less than two seconds. These events are seen in other galaxies many times each year but, in contrast to long duration bursts, without any corresponding visible light. If this is the explanation for the 774 / 775 radiation burst, then the merging stars could not be closer than about 3000 light years, or it would have led to the extinction of some terrestrial life. Based on the carbon-14 measurements, Hambaryan and Neuhӓuser believe the gamma ray burst originated in a system between 3000 and 12000 light years from the Sun. If they are right, then this would explain why no records exist of a supernova or auroral display. Other work suggests that some visible light is emitted during short gamma-ray bursts that could be seen in a relatively nearby event. This might only be seen for a few days and be easily missed, but nonetheless it may be worthwhile for historians to look again through contemporary texts. Astronomers could also look for the merged object, a 1200 year old black hole or neutron star 3000-12000 light years from the Sun but without the characteristic gas and dust of a supernova remnant. 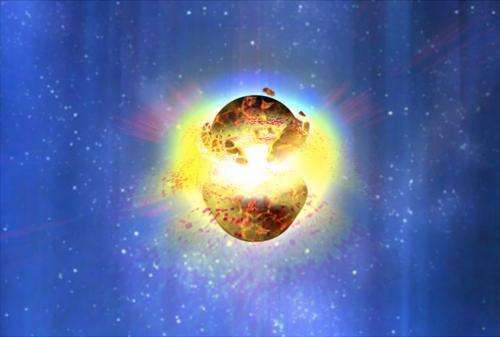 Dr Neuhӓuser comments: "If the gamma ray burst had been much closer to the Earth it would have caused significant harm to the biosphere. But even thousands of light years away, a similar event today could cause havoc with the sensitive electronic systems that advanced societies have come to depend on. The challenge now is to establish how rare such Carbon-14 spikes are i.e. how often such radiation bursts hit the Earth. In the last 3000 years, the maximum age of trees alive today, only one such event appears to have taken place." I can't imagine what it would be like to "see" a collision, but I wonder how fanciful the illustration is. For instance, given the gravity it seems unlikely large chunks would be knocked loose. Allowing that stuff could be knocked loose, it would be as dust, due to tidal stress? "But this dates from 776, too late to account for the carbon-14 data and still does not explain why no remnant has been detected"
serpents were seen in the land of the South-Saxons." They must have misread the date of the entry. Talk about an Act of G-d! Much closer and an entire hemisphere fries. Much closer than that and the planet is sterilized, game over. All you wacko environmentalists, consider this: one of the kinds of evil progress hampered by all your bitching and moaning is the distribution of Earth's biome--humans AND polar bears, dimwits!--far enough throughout space that your precious Gaea can actually SURVIVE a natural event that would sterilize her home planet. See, the Fermi Paradox has answers far darker than Singularity. Chilling. Also a great motivator for figuring out how to build a working gravity wave detector, as this is probably the only way reasonably accessible to us now of getting out in front of an impending GRB. Greed and ignorance know no bounds. jscroft provides an abundance of both. The world will become intellectually and morally superior with his passing. jscroft should consider how he would react if the machine replacements we are currently developing for ourselves were as disrespectful of human life as he is toward the rest of the Biosphere. Morality demands the extinction of corrupt and immoral ideologies like the one held by jscroft. Scott, you are a fool. The point of the Fermi Paradox comment was that we may not be hearing from our neighbors because they are periodically exterminated by GRBs. >> The world will become intellectually and morally superior with his passing. Big talk, tough guy. One wonders how brave you are outside Mom's basement. How do such events impact the calibration of C14, or any other isotopic dating method? Don't know how silly it is. My guess is that a high-frequency, enormously high-amplitude GRB would have a recognizably different impact on C isotopes than a CME. In fact, not entirely convinced that a CME would have ANY measurable effect 1000 years later. Not that I've really looked into it. Interesting question, but my guess would be not much. Remember the GRB flux is very powerful but only lasts a few minutes. I don't understand this statement. Gamma Rays are a form of EM radiation and move at the speed of light. How is a gravity wave detector going to give us advance notice (what I read from 'get out in front of') of an impending GRB? Gravity doesn't move faster than the speed of light. Neutron stars and other degenerate objects in close orbit are (at least in theory) a major source of gravity-wave signals. During the days or weeks prior to collision, I would anticipate that the GW signal would increase dramatically in frequency (as orbital decay causes the orbit frequency to increase) and amplitude (just a guess). Odds are this effect could furnish some kind of early warning of the impending GRB, if only we could detect it. A gravity wave detector could in theory detect an impending collision of 2 massive bodies (say 2 neutron stars) by the increasing frequency of the GW's as the 2 objects orbit each other closer and closer until they collide. Ahh. Thank you for the follow-up. I was thinking about detecting the gravity waves created by converting a small portion of the colliding bodies mass into energy. I was not thinking about the pattern generated by the two objects prior to collision. Yes, that was self evident. Why do you think that your unnecessary attempt to clarify your meaning in any way alters the immorality of your statement? While I sympathize, I note that your claim is just supposition. The speed of gravity has not been measured. They don't since there is no definitive record of any such event. Your question reeks of scientific ignorance, and if you were capable of learning that would be acceptable coming from an intellectual inferior such as yourself. But you have proven yourself to be incapable of learning. A gravity wave detector may work but would almost always lead to a false alarm as the GW's propagate in all directions but the GRB is highly directional and any going off in our galaxy has very small probability of being aimed at us! Post your address and I'll pop over for a visit. I'll bring you some muffins and a coffee, and then you can see for yourself. You forget that gravity waves will be primarily emitted along the plane of rotation of the binary pair, but the gamma rays will be directed mostly perpendicular to that plane. You are of course correct in pointing that out. I believe my premise that a GW detector would lead to a high false alarm rate is still valid. I don't know if the speed of gravity has been measured or not. I do know that that for the laws of physics as we understand them and the universe as we know it to be valid, the speed of gravity can't be faster than the speed of light. If it turns out to be otherwise, look me up and I will buy you a beer. How fast to entangled wave functions disentangle? The speed of light is infinite between scattering events. Given that the gravity waves and GRBs produced by such an event would be normal to eachother, it seems that we wouldn't receive any warning at all via gravity wave detection of an incoming GRB, since the gravity waves would be propagating at 90degrees relative to the GRB, and thus be undetectable here on Earth. @ryggesogn2: It wouldn't have much impact on dating other than C14 dating (potassium/argon, uranium etc. would not be affected). For C14 dating such events make object formed after the even look younger than the are. The 774/775 AD event was a 1.2% spike in C14, which would make plant matter that grew in 775 look 100 years younger than it is (~1150 years old instead of ~1250). The effect diminishes fairly rapidly as atmospheric carbon is drawn down by plants and new carbon is added from decomposition; plant matter formed in 780 AD would appear ~50 years younger than it is, etc. Such events in the last few thousand years can be found through tree rings (as this one was) and then compensated for. @Vendicar - JSCroft's comment is on saving the biosphere, so that is hardly disrespectful to the biosphere. @JSCroft - your comment is disrespectful to environmentalists. Many environmentalists support space research and not being bound to one vulnerable planet, just as you do, so why insult them? Your comment was valid, but the baggage that you saddled it with was counterproductive. The Earth doesn't orbit where the Sun was 8 minutes ago, it must orbit where it is now. In that vein, Pluto doesn't orbit where the Sun was 6 hours ago, if it did Pluto would be flung out of the solar system within a few thousand years. Actually it is thought to do just that. But it hasn't been measured. Observation of frame dragging is as close as observation has come to indirectly measuring the speed of gravity, and here only through the observed consistency of observation with GR. So, there is more than suspicion. The angular separation between where the center of the sun is now and where it will be in a few hours represents only a minute fraction of a degree at the distance of Pluto. We also know that the time interval of the arrival of gravity should be proportional to the distance from the sun, as will be the subtended angle through which the sun changes position as observed at Pluto, or any distance, so to a first approximation the effect is the same regardless of distance from the sun. GR is required to compute the difference. In the time it takes the Sun's light to arrive at Earth, the Sun will have traveled almost 100,000km toward it's north pole. It will have traveled 4,000,000km by the time it arrives at Pluto. Yet, the planets remain in their position in relation to the ecliptic while orbiting the Sun. If gravity was not nearly instantaneous on the solar system scale, the Sun would have left us behind long ago. Your presumption is that the sun is pulling pluto along for the ride. Pluto condensed out of the same cloud of dust as the sun and therefore shares the same or nearly the same velocity that the sun has with respect to the rest of the galaxy, or other objects that are farther away. There is a small differential force the sun feels while Pluto does not due to the relative positions of both objects with respect to distant objects. That differential force is well within the Newtonian realm and will produce no substantive difference due to the presumed speed of gravity. This has been an extremely interesting Article posting in that the conversations have been very informative and, well - civil. I have made comment on other articles that were declaratory simplifications that were rather obvious in afterthought. Please allow that this is a direct result of becoming an an old dog still attempting to learn new tricks. From now on I will attempt only to observe and learn - not simplify. In the time it takes the Sun's light to arrive at Earth, the Sun will have traveled almost 100,000km toward it's north pole. I am not getting why the Sun travels towards its north pole, against it's rotational axis. Can you please clarify? The Sun's ecliptic is at least 60 degrees off kilter to the galactic plane (ecliptic). The relative motion of the Sun is through it's north pole, that is to say the leading edge of the Sun is it's north pole. The rotation of the Sun follows the right-hand rule. It's a bit of a fallacy that the planets orbit the Sun in circular or elliptical orbits, in reality if you trace the orbits they would be spiral or helical in nature. In addition to that, the Sun itself actually traces out a spiral path, it's not on a bullet type trajectory, so to speak. The entire solar system is moving roughly in the direction of the constellation Hercules. This has no measurable implication to the speed of gravity. I don't know any scientist with a basic grasp of relativity that would say the speed of light "becomes infinite". But if it did... gravity cannot move faster than 'infinite'. QED. If the graviton is massless, then it moves at the speed of light. E=cP. If it is not massless, then it moves at some speed less than the speed of light, because the energy required to accelerate a particle with mass to the speed of light is infinite. We do not need to measure the speed of gravity to identify that gravity cannot move faster than the speed of light. While entangled wave functions collapse potentially with infinite speed, the information about that collapse does not exceed the speed of light. You and I are a lightyear apart, each with an entangled particle. Your measurement collapses the wave function. You radio me the result. I need that result to verify the wave function collapsed. It takes a year to arrive. EVEN if you and I agree that there is a 1 lightyear distance between us beforehand, and you radio me saying, "Ten minutes after you get this, I will collapse the wave function!" The information about the wave function collapsing will still take a YEAR to get to me. Even if you tell me before I board my ship, that you will collapse the function ten minutes after I get to my destination one light year out - from your frame of reference it will take a year at the VERY MINIMUM before I can measure my particle at my destination and verify the result. Scott. Wonders abound... apparently a blind squirrel CAN find a nut if it roots around long enough in Mom's basement! I stand corrected. Er... are gravity waves subject to polarization? Would the decaying orbit emit a weaker signal along the mutual orbital axis, but rotationally polarized? Regarding tea & cookies, tough guy: There's this thing called the Internet. Surely we can arrange a meeting without exposing our contact details to the world. If the contest occurs close enough to my neck of the woods, I'd be delighted to attend. Each combatant, upon completion of said dispute, will receive a pint of stout, which I will purchase at my own expense. I will also have salt for the loser's wounds. I'll bring my hat that holds 2 king cans...and spring for pizza. The tea and cookies can be dessert. Haha is it anywhere near Chicago? Scott's mom can finally fumigate that basement, and we can all feast on BBQ troll. Whaddaya say, Scott? Lets have a dance on the beach, Marine Corps style! Frigging Tard. If the gravity wave signal approaches zero at the axis of rotation in a predictable way then a constellation of three or more detectors sent out into space might be able to calculate where the GRB is pointed. The detection range would probably be limited by their relative spacing and their sensitivity but the closer threats should be easier to detect. Makes sense. Although I get the directional nature of the GRB pulse, I don't really have a good idea of how narrow the beam is. My guess would be not very, if the geometry is at all similar to pulsar beams. Maybe a dead-center hit would be minimally detectable, but it would also be minimally likely. Given the extreme damage one of those things could do, seems it would be worthwhile at least figuring out how common they really are. A detector array like the one you described would probably be the ideal tool for doing that. There should be also he effects on the other bodies in the solar system. The moon and asteroids should also have radioactive isotopes from a heavy GRB irradiation. Since it only lasts a minute, there should be a clear shadow in the radiation. This would show which face was towards the burst. When combined with several spinning bodies (perhaps including other moons) the exact date should be able to be determined, as well as the rough time and direction to within a couple of degrees. @Graeme: great suggestion - it just might work. It wouldn't be easy. Bodies without atmospheres would have sharp shadows for that one event, but without a rich supply of nitrogen the amount of C14 and Be10 would be tiny. Other isotopes would be produced, but long-lived isotopes would be masked by more accumulated bombardments and short-lived isotopes would have decayed already. But there should be some isotopes produced in typical rock that would have a half-life between a few hundred and a few thousands of years. Also worth pointing out that this technique might provide useful forensic data but would not help solve the early-warning problem. If these bursts last no longer than 2 seconds, would the effect not only be found in half of the world? Only the side facing the burst when it arrives would be exposed, no? Here's a little something I tried to try to locate a possible gamma ray source. Of course I am making a lot of assumptions here so take it with a grain of salt. which is surprisingly close to the first intersection point stated above. I forgot to mention the trees for this article's measurement are in Japan, and Cyg X-1 is 2 kiloparsecs away, within the range of paper's predicted distances of the gamma ray source.